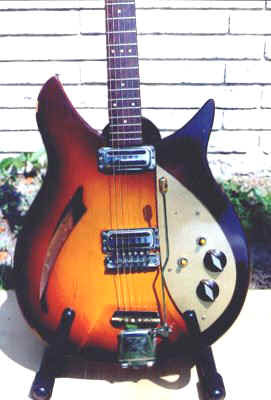 Rare 1958 335 Autumnglo Serial #2V-134. Features the "Long Prototype" sound hole and the scarce Kauffman vibrola. It has a 1/8 inch back which is standard on most all '58 Ricks. The back is heavily checked. 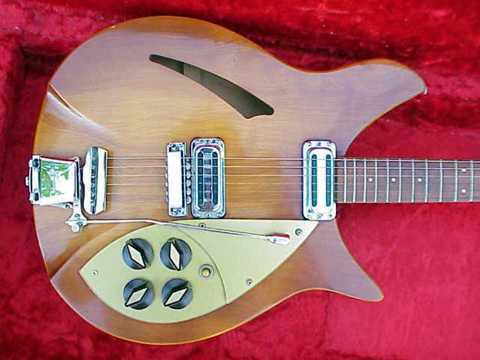 This model was made sometime in late 1958 maybe early 1959 It has a "normal" slash sound hole and 4 control knobs rather than as on the earlier models. One pickup switch and a Kauffman Vibrola. The serial # is 2V-318.